Last year, Snack Girl jumped into the healthy "candy" arena with a post that angered my readers. I suggested that you hand out individually wrapped prunes as Halloween candy (see Healthy Halloween Candy). So, I went back to the store and found some other healthy halloween candy ideas. I discovered "Special Dark" Chocolate Hershey's Kisses. They feature 180 mg of antioxidants per serving, and for 9 pieces it is about 180 calories. And, I suggested mini-Tootsie Pops at just 17 calories each. This year, I found the Hershey's kisses but not the mini-Tootsie pops at my local Target. Maybe they just haven't stocked these yet. Many readers commented that they don't even give out candy, and I noticed that the Halloween aisle of the store had themed pencils, stickers, plastic spiders, silly bands, etc. Handing out glow bracelets is also a great idea since it is DARK when the kids are out asking for treats. 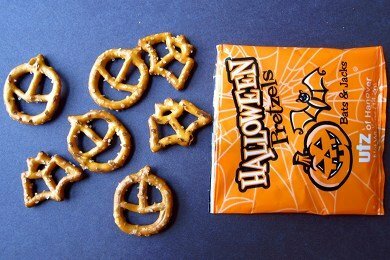 My new favorite "candy" option is these adorable Halloween Pretzels from Utz. A large bag of 35 small bags is $4 and my kids went bezerk over them. They go great with chocolate and my kids didn't even notice that they weren't candy. Yes, I feel like super mom! Hand me my cape! The one thing to keep in mind for buying Halloween candy is to stay AWAY from the sticky stuff like Starburst and Skittles. These candies stick to the teeth and are hard for little ones to clean off. You are much better off just giving out mini Hershey bars (soft and dissolvable candy). What are you going to give out this year? ive handed out the glow bracelets for years, this year we also have small packs of playing cards Disney themed. (war, old maid, go fish) I will have a little candy in hopes of having some left over :-) but I do love the preztels! My boys love them also! Just bought Snyder pretzels (30 for $3.99) and mini packs of Goldfish crackers (30 fo $4.99) at Target a couple of days ago. oh wow those pretzels are CUTE! I love pretzels (but i'll always love salty over sweet, probably meaning i should stay away from the pretzels since it's hard for me to stop. LOL) and as long as on average kids are more likely to eat sugary stuff than salty, giving them these pretzels is a much better idea. my kids aren't pretzel lovers, we had these before, a big bag from a discount store and no one ate them..
Susie, (or anyone) do you pre-snap the glow bracelets so they're already glowing? I snap them as I give them out. We don't have a extremely busy neighborhood so I can do it as they come up! Here are some alternatives to your child(ren) EATING all the candy they get from others! Many dentist offices offer a post-Halloween 'trade-in' where they pay your kids for their candy! Let them pick out a few favorites, then take the rest in! Most pay $1/lb, some pay more. Some teachers or librarians use candy as a reward or incentive, so you might see if there's any out there who need to add to their stash. My husband has a candy bowl to commemorate a deceased friend who always had one at his desk. So we take our less-favored holiday and birthday party candy and feed it to his coworkers instead! I also save some of the more interesting candy, since it should last the 6ish-weeks until gingerbread-house-making time! Your kids get beat up a lot? ;) Actually I kind of think small pieces of a decent quality chocolate might be better since some of the more popular brands of fish crackers and pretzels are super high in salt and contain hydrogenated oils. Because, if you honestly care enough about what the candy contains on this one special 'treat' occasion then you'd probably have a problem with the snacks too. Do the pretzels you showed have hydrogenated oils? I err more on the side of small pieces of candy without a ton of coloring (so like choc instead of say jolly ranchers) as I figure if you get some of those big packs you know the kid doesn't eat like half of it at a time- they scarf the whole thing. Smaller pieces makes it easier for the parent to ration. We have never given out candy ever. We are not candy eaters in our house so we give out non-candy items...always have. I wish I had known about the trade-ins at Dentist offices etc as we throw out about 95% of what thy collect because they don't/won't eat it (my girls are 2 & 5). I will call their Dentist office and see if they can guide me to a trade-in spot! If not, we will be tossing again. I'm lucky as my coldest is allergic to just about everything including nuts and soy so (which are in about everything out there) so she will toss out the candy before I even get to it. She loves to dress-up and go trick or treating so she can look at all the other costumes but the candy is never a big part of this or any holiday for us!! Thank God! I give out mini cans of play dough. Last year I was just handing it out to the younger kids and giving the older kids chocolate, but the older kids wanted play dough, too! The parents loved the idea. As a teacher, this is also the treat I give to my students. I have found it at Walmart. They even market it especially for Halloween if you look in the seasonal section. Phoebe, we give out the glow bracelets every year and we are in a real busy neighborhood. I usually snap them and put them together and put them in the bowl so they can grab whatever color they would like. Michaels has them pretty cheap esp when you have a coupon. Also Oriental trading company has a good selection. I try to stock up on the bracelets for many holidays like new years and 4th of July. Love the glow bracelet idea -- I've been using them at parties for years but it never occurred to me to give them out at Halloween! I buy packs of 10 at an "everything for a dollar" store. I know I'm in the minority, but I really loathe those mini-pretzel packs. None of the kids in my neighborhood eat them. @ Mel, thanks for the tip on the play-doh! @Maggie, okay I know this probably happens in several places, but based on your description, I have to ask... Any chance your parent's live in a small town in OH? Have to check out the glow bracelets... That seems like a great idea! Go ahead and hand those out. And quickly learn that next year the kids will avoid your place like the plague! Great idea for myself, but it's Holloween for goodness sake! Kids can live once in a while. I'm with David on that one...let kids be kids, its once a year!